Arguably the most famous movie theater in the world, Grauman's Chinese Theater is located on Hollywood Blvd in the heart of Hollywood. The theater opened to the public in 1927 at a cost of $2 million. 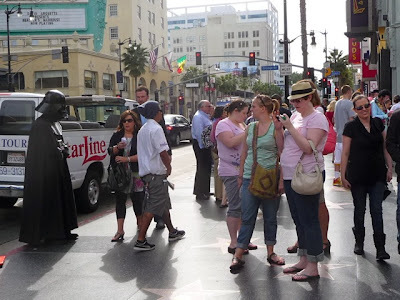 It's located at 6801 Hollywood Blvd. 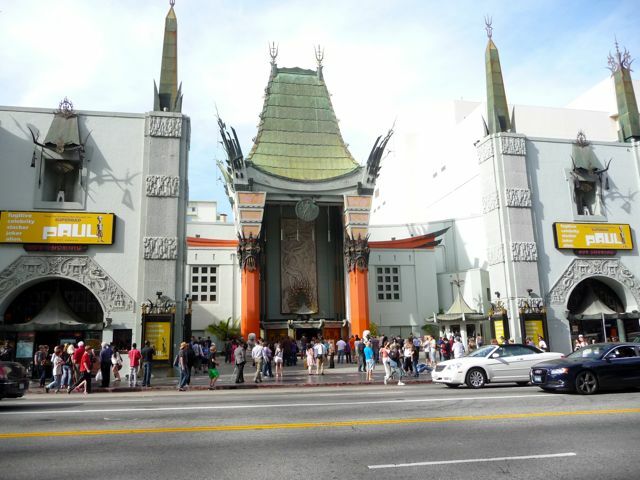 As a fully operating movie theater, Grauman's continues to show first run films. 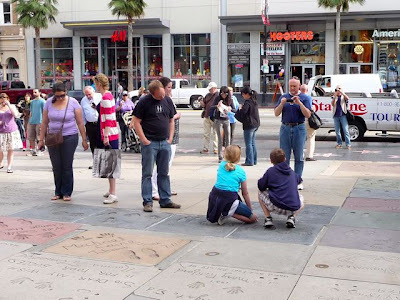 Of course, the real draw for people from around the world is it's famous footprint "Forecourt of the Stars." 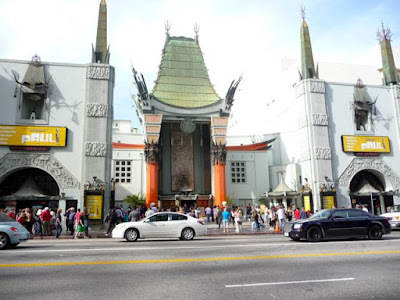 The story goes that in 1927 Mary Pickford, Douglas Fairbanks and Norma Talmadge accidentally stepped into some wet cement in front of the theater. 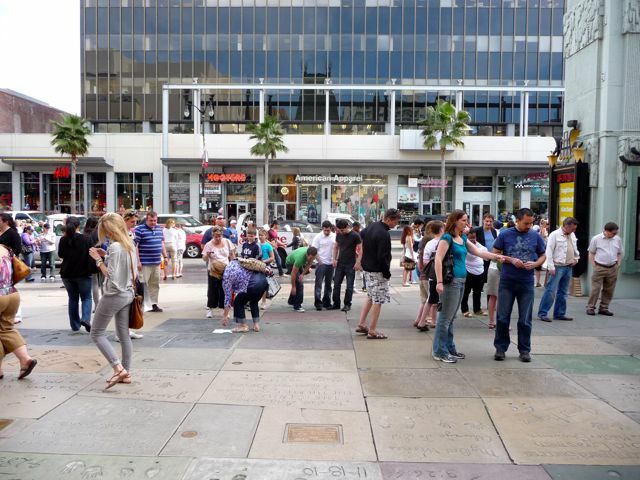 Ever the showman, theater owner Sid Grauman quickly had them sign their names below their footprints and the rest, as they say, was history. 85 years later, the forecourt continues to draw people from around the world. 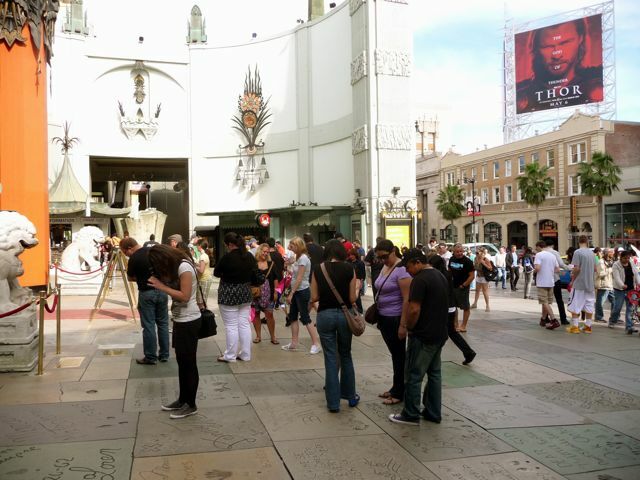 The are approximately 175 stars footprints (and in many cases, handprints) in front of the theater. Here's a link to a map, on the theater's website, listing the stars and where to find their prints. 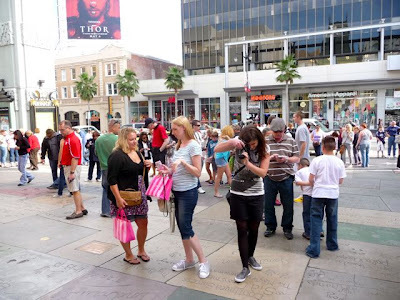 The forecourt is open to the public and absolutely free to visit. Hence, it's popularity - attracting two million visitors a year. 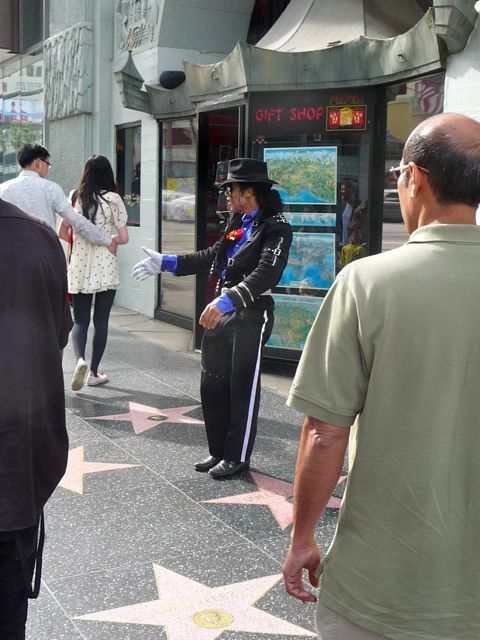 Just outside of the forecourt, on the public sidewalk, are celebrity impersonators posing for photographs, for tips (of course). 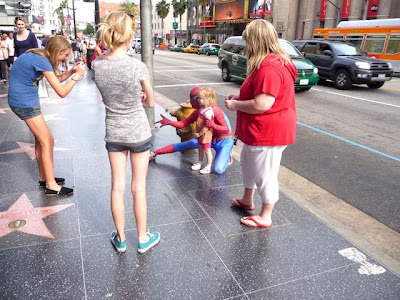 Apparently, Michael Jackson, Spiderman and all the rest can not legally charge for photos, but they can ask for tips. 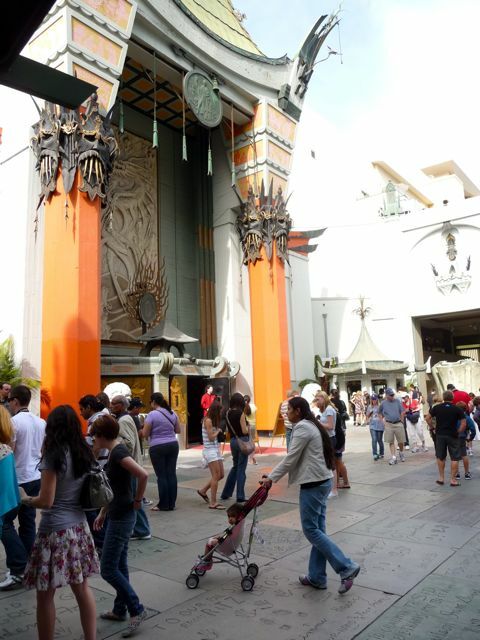 Families pay hundreds of dollars to get into Disneyland - and then line up for 30 minutes to get a picture with Mickey Mouse. I guess tipping a dollar or two to get a pic with Darth Vader is a pretty good deal. 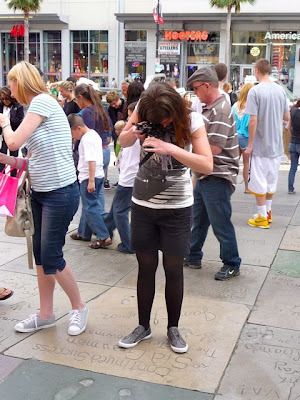 I mean, hey, no wait. Down the street, you'll find Elvis chatting it up with a Japanese geisha girl. 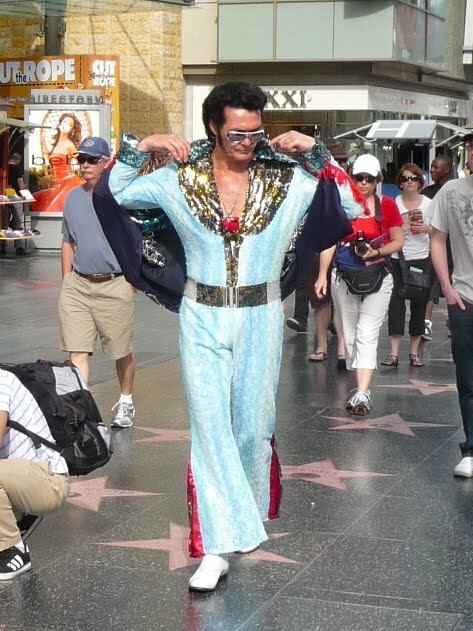 The King heading back to his "spot" on the sidewalk. 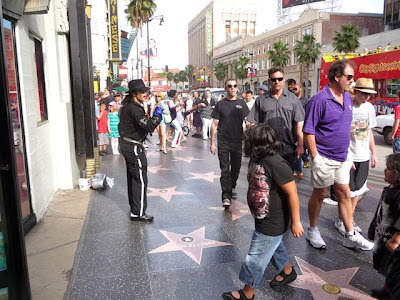 Of maybe he's going to meet up with the Scream guy. 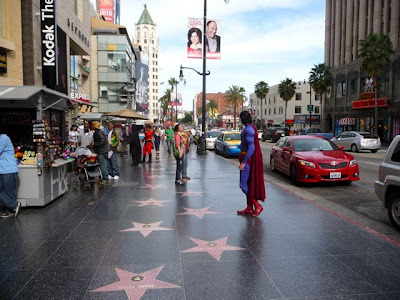 Or Superman. Looks like a slow day for the Man of Steel. 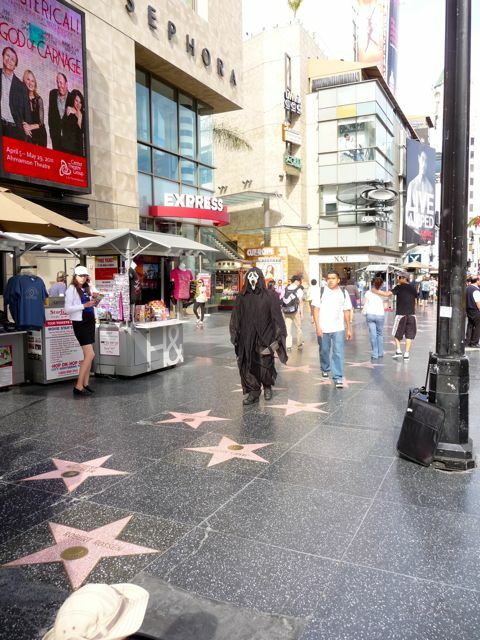 By the way, you'll notice along the sidewalk are the stars of the Hollywood "Walk of Fame." 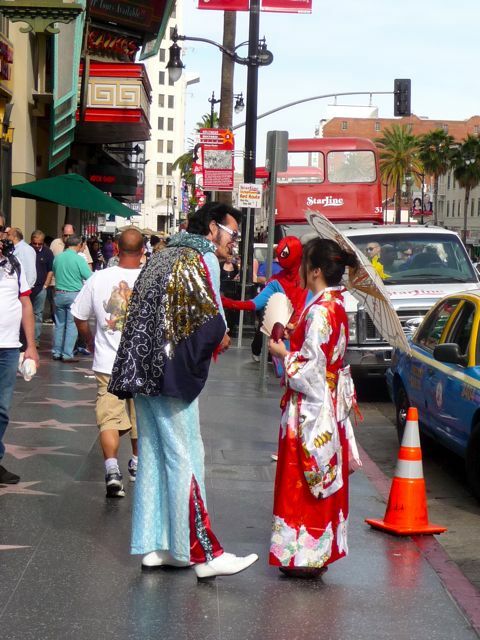 Unlike the very limited space in the Chinese Theater forecourt, there are over 2400 stars along Hollywood Blvd. 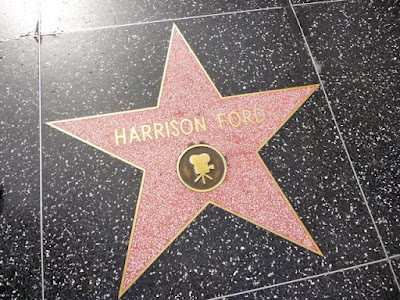 Above, Harrison Ford's star at 6801 Hollywood Blvd (conveniently located directly in front of the Theater). Here's a link to a list of all the stars found on the Walk of Fame. Back on the street to Michael Jackson: looks like the King of Pop was trying to drum up business. 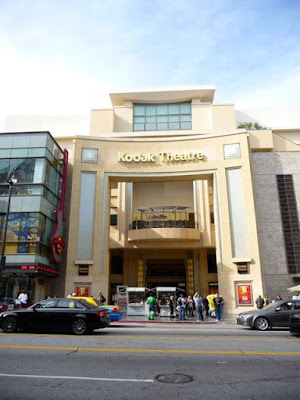 Down the street from Grauman's Chinese Theater is the Kodak Theater, part of the larger "Hollywood and Highland" complex. 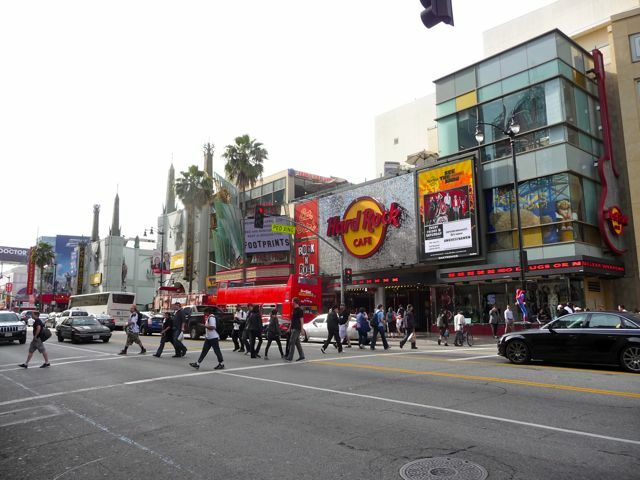 In between the Kodak Theater and Grauman's Chinese is the Hard Rock Cafe, a restaurant chain found in major cities around the world (we didn't bother to stop). Another look at the Kodak Theater. 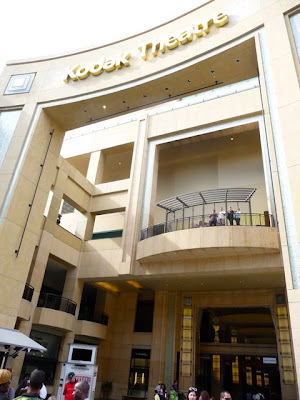 The Kodak was specifically built to host the Academy Awards, although there is talk of possibly moving the Academy Awards to the larger Nokia Theater a few miles away in downtown Los Angeles. "That's All Folks" - for now. More on the Hollywood and Highland complex in Part II next week. Here's a link to the Grauman's Chinese Theater website.